Notice that we have shrunk the scale of today’s chart, in order to take in a wide sweep of sky, from northeast to southeast. Tonight, let the Big Dipper introduce you to another bright star. This star is Spica in the constellation Virgo the Maiden. 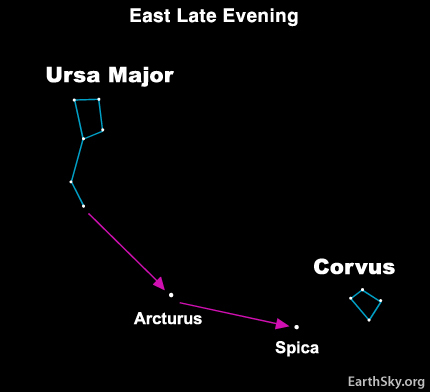 If you are outside this evening, you can follow the arc to Arcturus and drive a spike to Spica. In other words, today’s chart shows a wide sweep of sky, from northeast to southeast in late evening. First follow the curve made by these stars in the Big Dipper’s handle to the star Arcturus in the constellation Bootes: follow the arc to Arcturus. Now extends the curve in the handle into the southeastern sky: drive a spike to Spica. Spica in the constellation Virgo looks like one star, but this single point of light is really a multiple star system – with at least three member stars – located an estimated distance of 262 light-years away. Spica’s constellation, Virgo, is so large and rambling and difficult to see that I haven’t marked it. However, you can look for a little squarish figure to the upper right of Spica on today’s chart. This is the constellation Corvus the Crow. As Earth travels around the sun, all the stars rise four minutes earlier each day. Thus, these stars will be rising earlier – and appearing higher in the sky earlier in the evening – in the coming months. Site contents copyright © 2019 Recorder Online	except as noted. All rights reserved. | 88 queries in 2.185 seconds.